2015/16 Ukrainian League. 25th round. May 8, 2016. Lviv. Arena Lviv. 13 oC. Compared with the match against Sevilla in the semi-finals of the Europa League, the Pitmen's starting lineup in the game against Karpaty included only two footballers: Viktor Kovalenko and Maksym Malyshev. The latter was entrusted with the captain's band for the first time ever. 5 minutes into the game the referee awarded a penalty to Karpaty: after a cross into the penalty area the ball hit the hand of Serhiy Kryvtsov. However, Anton Kanibolotskyi deflected Holodiuk's right corner. In the next attack, Dentinho took a dangerous shot from 23 metres but the goalkeeper of the Lviv team saved it. The Donetsk team seized the initiative, but did not create any scoring chances. In the 17th minute, Dentinho left the field due to injury, and was replaced by Taison. Soon, Facundo Ferreyra had an opportunity when striking into the near corner but the goalkeeper parried the ball, and a couple of minutes later, the referee wiped off a goal by Serhiy Kryvtsov, determining that the ball went out of bounds during a right corner. In the 36th minute, Karpaty suddenly opened the scoring: after a cross by Blanco into the penalty area, Leshchuk's header was dead on target in the top corner - 1-0. The score remained the same until half-time, although Wellington Nem was close to success, but his excellent long range shot went wide. After half-time, the Pitmen continued to escalate, and 53 minutes into the second half the referee had a reason to award a penalty when Nem was brought down in Karpaty's penalty area, but there was no whistle. The Lviv team responded with fast counterattacks, but without any real threat. At the end of 60 minutes, the coaching staff of Shakhtar made a double substitution, putting Eduardo and Marlos onto the field. And soon the score became 1-1 - Vyacheslav Shevchuk made a dangerous cross into the penalty area from the left and Lviv defender Hitchenko turned the ball into his own net. Taison had another opportunity, but his header went over the crossbar. The Pitmen attacked a lot and in different ways. In the 82nd minute, Eduardo had a great opportunity to score after a low cross by Marlos from the right, but was a moment too late to the ball at the far post. It should be noted that Kanibolotskiy also had work to do - the Shakhtar goalkeeper deflected an aimed shot by Blanco Leshchuk. In the next attack Nem was brought down in the penalty area and the referee awarded a penalty. Marlos' shotwas accurate, and brought victory for the Pitmen (2-1). 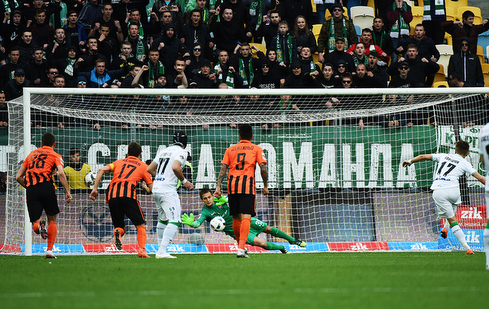 The home team rushed for a come-back, but before the final whistle Shevchuk had an opportunity to increase the lead - his shot along the woodwork could have led to yet another own goal. Thus, Shakhtar's next match will take place on May 11 against Oleksandriya, at same place - Arena Lviv. It will be the 2nd leg of the Ukrainian Cup semi-finals, with the first leg ending in a draw - 1-1.